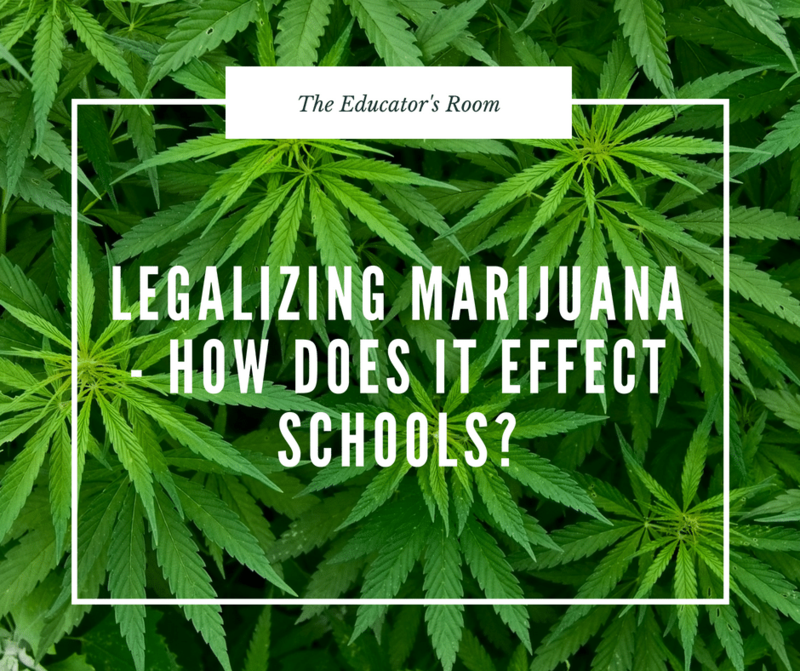 Legalizing Marijuana – How does it Effect Schools? Pot. Grass. Herb. Bud. Cheeba. 420. Mary Jane. You’ve probably smoked it. You’ve at least been around people who have smoked it. If not, you’ve seen it smoked on TV or the movies and thought those scenes were hilarious, it’s okay, you can admit it. In 2018 there are now eight states who have legalized marijuana for recreational use among adults. These states include: Alaska, California, Colorado, Maine, Massachusetts, Nevada, Oregon, Washington, and the District of Columbia. Surely, now that marijuana is legally available for adults in these states there are implications for teachers and students. Since pot is regularly available and more socially acceptable in these states, I am left wondering how this affects the students and what sorts of changes are teachers seeing in the classroom? According to the article, “Marijuana legalization and its impact on schools,” from District Administration Magazine, in Colorado, prior to the legalization of pot in 2012, students would be expelled for having marijuana on them at school. Now, it’s treated more like alcohol possession, and students are suspended before they are expelled. Another factor to consider is that it is more difficult for school personnel and local police to test whether a student is under the influence of marijuana as opposed to alcohol. So, if a student comes to school and a teacher suspects that they may be high, it is a lot harder to prove than if a student comes to school drunk. Local police departments could have a student take a urine test, but any pot they have smoked within the last few days or weeks is likely to show up, so it wouldn’t necessarily indicate that the student was under the influence of marijuana on that day. Are students smoking more dope now that it’s legal for adults? So, maybe being honest with students about the effects of marijuana is the answer. Interesting. There is plenty of data that suggests marijuana is harmful to the adolescent brain, hence the 21 or over limitation. According to Patti Neighmond’s NPR article, there is more and more evidence from leading scientists that shows regular marijuana use (described as once a week or more), “actually changes the structure of the teenage brain, specifically in areas dealing with memory and problem solving.” Clearly, this would affect a student’s performance in school, and there is plenty of evidence to show that students who smoke marijuana regularly, have lower GPAs than their peers who do not smoke pot. Bottom line is just because pot is made legal, doesn’t necessarily mean students are smoking more of it. Just because it is legal for adults, doesn’t mean it’s safe and okay for students to use it. In fact, it can harm students’ developing brains and have negative effects on their memory and cognition. If you are caught with weed at school, just like with alcohol, you will still get in trouble and most likely face suspension. Health curriculums are becoming more honest, focusing on harm reduction instead of using scare tactics to keep students safe from marijuana usage. I am a teacher for K-12 students. Your opening line was very sad and as I read “and you probably…” I grew up in the 70’s, in California, known for its wild times with grass. Until I was 62, I NEVER even smelled it, let alone being around someone who smoked it. That doesn’t mean I wasn’t around someone who did smoke it…some of my family members and they are legend for their behavior to this day. They are dysfunctional. The students I am around whose parents smoke it are a nightmare because they come in as second choice and they know it. The students who smoke it show up unprepared…oh, by the way…they aren’t ‘mellow’ either. Since legalization won’t take away the side effects and education doesn’t work because it is such a joke to even talk about, I don’t know if there is an answer. I know, for myself, dealing with family members who are hooked on a non-addictive drug, I made my own choice not to indulge. If a person knows they would get their arm torn off in a bear cage, they don’t put their arm in the bear cage. With marijuana, its a bear but the bear tears the arm off in little bits and pieces where you don’t know its being torn off. Who knows, maybe American people are addicted to being addicted to the drug and to the problems it causes.